Goddard, Stacie E. 2018. Embedded Revisionism: Networks, Institutions, and Challenges to World Order. International Organization, Vol. 72, Issue. 04, p. 763. War is often described as an extension of politics by violent means. With contributions from twenty-eight eminent historians, Volume 2 of The Cambridge History of the Second World War examines the relationship between ideology and politics in the war's origins, dynamics and consequences. 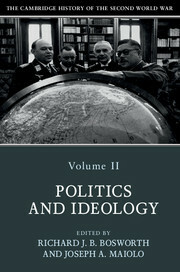 Part I examines the ideologies of the combatants and shows how the war can be understood as a struggle of words, ideas and values with the rival powers expressing divergent claims to justice and controlling news from the front in order to sustain moral and influence international opinion. Part II looks at politics from the perspective of pre-war and wartime diplomacy as well as examining the way in which neutrals were treated and behaved. The volume concludes by assessing the impact of states, politics and ideology on the fate of individuals as occupied and liberated peoples, collaborators and resistors, and as British and French colonial subjects.